Jacques Hymans. Achieving Nuclear Ambitions: Scientists, Politicians, and Proliferation. Cambridge: Cambridge University Press, 2012. ISBN: 9780521767002 (hardcover, $95.00); 9780521132251 (paperback, $32.99). The assumption that proliferation is surely easier for later nuclear aspirants than it was for previous ones makes logical sense. The only problem, as Jacques Hymans demonstrates in his terrific new book, is that the historical record shows that the common wisdom is quite wrong. Seven states attempted to get the nuclear bomb between the 1940’s and 1960’s and all of these efforts were successful, with an average time from start to finish of only seven years. In contrast, since 1970 only three out of ten state attempts to acquire a nuclear capability have been successful and the average time to completion rose from seven to seventeen years (3-5). While there are numerous factors that scholars put forward to help explain the declining success of nuclear aspirants, such as the emergence of the Non-Proliferation treaty regime in 1970, Hymans convincingly argues for the central importance of efficient management. Like any complex scientific project, acquiring nuclear weapons requires a professional management system that enables scientists and engineers to proceed autonomously from state interference. As Hymans demonstrates in a number of intriguing case studies ranging from Yugoslavia to Argentina to Iraq, the fundamental factors that explain success or failure in efforts to achieve a nuclear capability are internal rather than external. In his view, “Weberian legal-rational” states are far more likely than “neo-patrimonial” states to be successful in acquiring nuclear weapons because the former type of state can handle meddlesome leadership interference while the latter cannot (26-27). All the reviewers are in complete agreement that Achieving Nuclear Ambitions is an exemplary work of scholarship that makes an important contribution to the growing literature on nuclear proliferation. Michael Chase believes that it is a “superb” book with numerous important implications for policymakers. Of course, there are some important places of disagreement between Hymans and the reviewers. Matthew Fuhrmann believes that Hyman’s book would have been even better had it paid closer attention to alternative explanations of proliferation successes and failures. While Hymans has written what he calls a “marvelous book,” Guarav Kampani is not convinced that the evidence supports the contention that proliferation failures can be attributed to bad and meddling political leadership. What emerges quite clearly from the reviews, as well as from Hymans’s response, is that there is a developing and persuasive counterpoint to the prevalent alarmist view of the ease of nuclear proliferation. As both Hymans and his reviewers demonstrate, there are numerous important policy implications that follow from this new perspective on nuclear proliferation. The editors would like to thank all of the participants in this roundtable and we extend our congratulations to Jacques Hymans for his important and highly relevant new book. It is a very worthy recipient of the American Political Science Association’s 2013 Don K. Price Award, which is awarded to the best book on science, technology, and environmental politics published within the last year. Jacques E.C. Hymans is Associate Professor of international relations at the University of Southern California. Hymans’s The Psychology of Nuclear Proliferation: Identity, Emotions, and Foreign Policy (Cambridge University Press, 2006) received the Alexander L. George Book Award for best book in political psychology from the International Society of Political Psychology and the Edgar S. Furniss Book Award for best first book in national and international security from the Mershon Center at the Ohio State University. 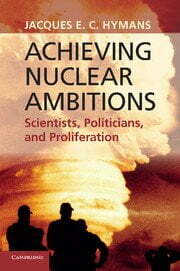 His second book, Achieving Nuclear Ambitions: Scientists, Politicians, and Proliferation (Cambridge University Press, 2012) won the Don K. Price Award for best book in science, technology and environmental politics from the American Political Science Association. Hymans has also published journal articles in such outlets as Foreign Affairs, International Security, Security Studies, the European Journal of International Relations, and the Nonproliferation Review. Michael S. Chase is an Associate Professor in the Warfare Analysis and Research Department at the U.S. Naval War College in Newport, Rhode Island. He is also Director of the Mahan Research Group, a student-faculty research group that focuses on strategic deterrence and Asia-Pacific security issues. Prior to joining the faculty at the War College, Professor Chase served as a research analyst with Defense Group Inc. in Washington, DC and an associate international policy analyst with the RAND Corporation in Arlington, VA. Professor Chase earned a Ph.D. in international affairs from the Johns Hopkins University’s School of Advanced International Studies (SAIS) in Washington, DC. He also holds an M.A. in China studies from SAIS and a B.A. in politics from Brandeis University. He is the author of the book Taiwan’s Security Policy: External Threats and Domestic Politics, as well as numerous articles on Chinese military modernization and Asia-Pacific security issues. Matthew Fuhrmann is an Assistant Professor of Political Science at Texas A&M University. He is the author of Atomic Assistance: How “Atoms for Peace” Programs Cause Nuclear Insecurity (Cornell University Press, 2012) and the co-editor of The Nuclear Renaissance and International Security (Stanford University Press, 2013). Gaurav Kampani is a doctoral student at Cornell University’s Department of Government. His dissertation examines Indian civil-military institutions and nuclear weapons-related operational practices in the decade prior 1998 and the decade since. Between 1998 and 2005, he worked on South Asia-related nuclear and missile proliferation issues at the James Martin Center for Nonproliferation Studies, Monterey CA. Jacques E. C. Hymans has written a superb book on a timely and relevant issue of major importance to security studies scholars, defense planners, nuclear analysts, and national security policymakers. In Achieving Nuclear Ambitions: Scientists, Politicians, and Proliferation, Professor Hymans explores an empirical puzzle of major theoretical and practical importance. Despite numerous predictions that the leaders of more countries would choose to develop nuclear weapons, and that over time it would only become easier—and therefore quicker—for these nuclear aspirants to do so, what has happened appears to be just the opposite: the efficiency of nuclear weapons projects has declined. Some efforts have ended in failure, and others have taken a very long time to achieve even modest levels of success. Whereas the United States, Soviet Union, United Kingdom, France, China, Israel, and India all went from project start to a successful outcome in relatively short periods of time, most countries that began their projects in the 1970s or later haven’t done nearly as well. Only South Africa achieved success relatively quickly (though it later chose to eliminate its nuclear weapons). Libya, South Korea, Yugoslavia, Brazil, Iraq, and Syria failed to develop nuclear weapons. Pakistan and North Korea were ultimately successful, but only after prolonged efforts. The outcome in the case of Iran is still uncertain, but however it turns out, Tehran’s program has clearly been a work in progress for a very long time. This begs an obvious question: what explains these trends? Hymans contends that the standard variables—techno-centric consideration, the top leadership’s determination, the effects of the Non-Proliferation Treaty (NPT); alliance factors; threats of military action; and the availability of economic resources—fail to adequately explain this puzzle. Instead, he argues, institutional variables must be given pride of place in explaining the success or failure of nuclear weapons project implementation. Hymans argues that the quality of institutions is central. Scientific and technical professionalism is a key determinant of project efficiency, and it must be fostered by good management. Top-down political control is not a recipe for success in the nuclear weapons business. Leadership attention and large-scale investment are unlikely to substitute for a management system that respects the autonomy of scientists and engineers. Good management, in turn, is much more likely in states with well-developed institutions. States in the developed world are more likely to have such institutions, but states in the developing world, where most attempts at nuclear proliferation have been centered in recent decades, are much less likely to fare as well in this regard. Hymans argues that this accounts for failed programs and increased timelines among many of the more recent nuclear aspirants. Hymans’s book is clearly written and well organized. After developing his theory, he turns to testing it by carefully examining four historical case studies (the nuclear programs pursued by Iraq, China, Yugoslavia, and Argentina). Hymans then applies his theory to offer brief explanations of some more contemporary cases — Libya, Pakistan, North Korea, and Iran. Although brief, these mini-case studies are lively and engaging. The central argument—that management and institutions matter at least as much as more frequently studied variables like technical capability—has important implications for analysts and policy-makers. My overall response to this book is very positive. Accordingly, I will turn to a discussion of the policy implications and some of the many possibilities that this work may suggest for future research on related issues. An important implication of this research is that for political reasons, developing-world dictators seeking nuclear arsenals are likely to find it a protracted struggle, and in some cases they may not be able to achieve their nuclear ambitions at all. At the very least, they are unlikely to be able to develop nuclear weapons very quickly. This means that the United States and other countries will have ample time to work toward their non-proliferation objectives, and that dramatic measures (such as preventive attack on one end of the spectrum, or giving in to what is effectively nuclear blackmail on the other) will be unnecessary. If nuclear programs will fail, or at least fail to reach success quickly and efficiently, because of poor management and other institutional shortcomings, policymakers seeking to stem proliferation will have more options, and they will be able to allow more time for those options to work. That bomb in the basement won’t be built overnight, at least not in countries that lack the well-developed institutions conducive to efficient and effective management of a scientific and technical undertaking as large and complex as a nuclear weapons program. Hymans’s research suggests that the future nuclear projects most likely to succeed, and to do so relatively quickly, would be those in developed states with functional institutions that would allow for competent management of major scientific and technological undertakings. This is clearly not a description of many (or perhaps any) of the countries that have caused the greatest concerns in recent years. It is, however, a pretty good description of a number of U.S. allies, including some that live in potentially dangerous neighborhoods (South Korea and Japan come to mind). Indeed, U.S. nuclear weapons have long been intended not only to deter would-be adversaries, but also to assure nervous allies that they can rely on the U.S. arsenal for extended deterrence, and therefore do not need to develop nuclear weapons of their own. Hymans’s research seems to suggest that assurance of these allies remains a very important policy issue for the United States, and that convincing them that they do not need their own nuclear arsenals is still a very important role of U.S. nuclear weapons. This is not to suggest that further reductions–or even deep cuts–in the U.S. nuclear arsenal would automatically undermine America’s ability to assure its allies. Indeed, I believe that the United States would be able to effectively deter potential adversaries and assure U.S. allies even at much lower numbers of nuclear weapons, as long as it retains a survivable retaliatory capability. My point is simply that the United States will need to continue devoting careful diplomatic attention to the concerns of its allies, especially because Hymans’s research suggests that they are among the countries ‘most likely to succeed,’ and perhaps relatively quickly, should they decide to launch nuclear weapons projects in response to concerns about the credibility of U.S. security assurances. Although Hymans’s work focuses on new nuclear aspirants, his conclusion that management matters may well have important implications for attempts by existing nuclear powers to enlarge and/or enhance the quality of their arsenals. This is an important question for scholars, analysts, and policymakers, as several of the world’s nuclear powers are currently attempting to do one or both of the above. China continues to adhere to a No First Use (NFU) policy, but it is modernizing and expanding its nuclear force. The main concern seems to be ensuring that it will have a credible deterrent that will not be undermined by U.S. missile defense capabilities. Accordingly, China is deploying road-mobile inter-continental ballistic missiles (ICBMs), preparing to add a sea-based deterrent to its nuclear force with its second-generation nuclear-powered ballistic missile submarines (SSBNs), and may be developing a new mobile ICBM that could be equipped with multiple independently targetable reentry vehicles (MIRVs). China does not seek parity with the United States and Russia. But Beijing appears resistant to participating in formal arms control agreements, partly because it sees Washington and Moscow as bearing primary responsibility for further nuclear reductions given their much larger arsenals, and partly because of longstanding concerns that greater transparency could weaken, rather than strengthen, the credibility of China’s growing but still relatively modest nuclear deterrent capabilities. In South Asia, Pakistan’s expansion of its nuclear arsenal has been the subject of considerable media attention in recent years. Pakistan’s main goal seems to be ensuring it will be able to deter India, and Pakistani planners appear to have concluded that its nuclear arsenal, including tactical nuclear weapons, enable Pakistan to counter India’s conventional military superiority. India is modernizing its nuclear forces as well, as it is concerned not only about Pakistan, but also about competition with China. Russia is hardly interested in a nuclear arms race, but it is determined to ensure the continued credibility of its strategic nuclear deterrent, and it still maintains a large number of tactical nuclear weapons. This seems unlikely to change anytime soon, especially given the central role of nuclear weapons in Russia’s defense strategy. The Yuri Dolgorukiy, the first of a new class of SSBNs, recently entered service with the Russian Navy, reflecting Russia’s commitment to modernizing its nuclear forces and maintaining its status as one of the world’s two nuclear superpowers. The United States is reducing its reliance on nuclear weapons and moving toward further limiting their role, even though it has not yet reached the point where it is ready to declare that their sole purpose is deterring nuclear attack against the United States and its allies. In keeping with President Barack Obama’s vision of a nuclear free world, the number of U.S. nuclear weapons would seem to be quite likely to decline further in coming years. Nonetheless, the United States will continue to modernize its nuclear capabilities to ensure that its smaller force is fully effective as a deterrent to potential adversaries, and continues to adequately assure U.S. allies so that they will remain confident they do not need their own nuclear weapons. The replacement of the Ohio-class nuclear-powered ballistic missile submarines to provide a survivable sea-based nuclear deterrent into the 2080s is perhaps the most important and highest-profile program for the future of America’s nuclear deterrent. North Korea’s nuclear program is a longstanding concern, one that is likely to become more pressing for the United States, South Korea, Japan, and China if Pyongyang follows through on its threats to conduct a third nuclear test and persists in “modernizing and expanding its nuclear deterrent capability beyond the U.S. imagination.” North Korea is also developing a road-mobile ICBM, which is presumably intended to provide it with a survivable nuclear deterrent. Perhaps Hymans or other scholars could build upon Achieving Nuclear Ambitions by looking at the efficiency of such force modernization efforts among the established nuclear powers. What explains the success or failure of nuclear force modernization programs? What factors most heavily influence the timelines associated with their completion? Will these countries find that the quality of institutions and project management will be the key variables that influence the outcomes of their attempts to field larger and/or more capable nuclear forces? Nuclear proliferation was among the most studied topics in security studies during the Cold War. Yet when the Soviet Union collapsed, many scholars assumed that nuclear weapons were no longer interesting or relevant. Over the last decade, however, there has been a renaissance in scholarship on nuclear issues – in part because the crises in Iran and North Korea underscored the continued significance of proliferation in the post-Cold War world. Jacques Hymans’s fascinating book, Achieving Nuclear Ambitions: Scientists, Politicians, and Proliferation, makes a critical contribution to this new wave of research. Several recent books and articles focus on why countries pursue nuclear weapons. Hymans asks a slightly different question: Why do some nuclear weapons programs succeed while others fail, and what explains variation in the amount of time it takes states to build the bomb? The answer, according to Hymans, has to do with domestic political relationships and institutions. In particular, how leaders and other key officials manage nuclear programs plays a key role in determining how efficiently they operate. Hymans distinguishes between two ideal types of states: Weberian legal-rational and neo-patrimonial. Weberian legal-rational regimes, he argues, can effectively manage nuclear programs because they show respect for scientists’ professional autonomy (41-71). Those regimes provide scientists with sufficient resources, allow them to control their own work process, and motivate them to work hard by appealing to nationalism. Neo-patrimonial regimes, on the other hand, have poorly managed nuclear programs because leaders fail to respect the autonomy of scientists and often meddle in nuclear programs. In devoting theoretical attention to management problems, Hymans adds significantly to the literature on nuclear proliferation. Scholars seeking to explain why nuclear weapons spread have previously focused on domestic political factors such as regime type, bureaucratic politics, and leaders’ preferences and beliefs. Yet Achieving Nuclear Ambitions is the first book to develop a complete and systematic argument about how the management of nuclear programs affects their efficiency. Hymans’s core argument is creative and logically sound. One potential limitation of his theory, however, is that the fit between the macro and micro arguments is not as tight as it could be. His claim that respect for professionals produces efficient nuclear programs is persuasive. Yet the source of this respect is not always clear. In some cases it appears to emerge from a state’s domestic institutions, as Hymans argues, but this is not always the case. The Soviet Union, for instance, was a neo-patrimonial regime when it acquired the bomb but it managed to operate the second most efficient nuclear program in history. Hymans contends that the Soviets succeeded swiftly because elites respected the autonomy of the nuclear program. So this case would seem to support his micro argument but not his macro one. Chinese leaders similarly managed to respect nuclear scientists – at least in the period leading up to China’s first nuclear test in 1964 – despite its status as a neo-patrimonial regime. And the United States does not actually score all that high on the government capacity index that Hymans uses as a proxy for Weberian legal-rational regimes (Britain, France, South Africa, and Israel all score higher). Yet the Manhattan Project is the most efficient nuclear weapons project to date. This evidence does not imply that Hymans’s argument is wrong, of course, but it does raise the question as to why the macro and micro components of his theory tie together nicely in some cases but not others. There are several other conceivable theories for why nuclear projects succeed, and Hymans does a nice job summarizing them in Chapter 1. Yet he discards some of the alternative explanations prematurely, sometimes on the basis of contradictory evidence from a small number of cases. Consider, for example, the argument that leaders’ political resolve to go nuclear determines how quickly a country will build the bomb. According to this logic, nuclear programs will bear fruit quickly when leaders are highly motivated to proliferate, while atomic projects will flounder when elites do not have an urgent need to possess the bomb. Hymans claims that this theory does not explain nuclear weapons program efficiency very well. He points to the cases of France, India, and Israel. In all of these cases, he argues, bureaucratic momentum pushed nuclear programs forward even as leaders had reservations about going nuclear. Hymans is correct. The problem is that in other cases leaders’ will to build the bomb played a critical role. It is hard to explain the efficiency of the U.S. nuclear program without reference to the fact that the United States was embroiled in the most massive war in history. Turning this logic on its head, one could argue that changes in Brazil’s security environment lessened that country’s strategic need to possess the bomb, contributing to nuclear inefficiency. To be sure, leaders’ will to go nuclear cannot explain every case. But it is a significant variable in several cases and, therefore, Hymans’s book would have been stronger if he did not cast it (and other alternative variables) aside so quickly. Hymans tests his core management argument with two thoughtful, well-written case studies: Iraq and China. The Iraqi case shows how the micromanagement of nuclear programs can lead to their demise. In the China case study, Hymans shows how respect for scientific work can enhance the efficiency of nuclear projects. The focus on a small number of empirical cases raises some obvious questions: How representative are the experiences of China and Iraq? Does empirical support from these cases imply that the argument is generalizable? To his credit, Hymans is aware of these challenges. He addresses concerns about generalizability by conducting a quantitative analysis of his macro-level hypothesis and briefly reviewing the first five nuclear weapons programs in Chapter 1. Then, in Chapter 7, he conducts mini-case studies of four contemporary nuclear programs: those in Libya, Pakistan, North Korea, and Iran. These analyses inspire greater confidence in the empirical validity of Hymans’s main theory. Hymans could have strengthened his empirical analysis by devoting greater attention to the alternative theories in the case studies. In the chapter on Iraq, he briefly discusses the “Osiraq myth” (96-98) – the idea that Israel’s 1981 strike against Iraq’s nuclear plant delayed the nuclear program – but he does not evaluate the other possible explanations that are discussed in Chapter 1 in detail. In the China case he usefully discusses the role of international nuclear assistance (130-132) but he does not seriously engage the other alternative arguments. His main case studies, then, may persuade readers that management matters, but they are less useful for understanding how much it matters relative to other factors. He states at one point that his argument explains at least as much as others involving export controls, technical safeguards, and the nonproliferation regime (57). This may be true, but it is not a conclusion that flows naturally from his analysis. The majority of Achieving Nuclear Ambitions is about how management and domestic institutions affect the efficiency of nuclear weapons projects. Yet Hymans also analyzes how international nuclear assistance influences nuclear proliferation. He argues that peaceful nuclear assistance from foreign suppliers can slow down nuclear programs when it is provided to neo-patrimonial regimes (although he acknowledges that this aid can facilitate proliferation when it is provided to Weberian legal-rational regimes). Neo-patrimonial regimes, then, are actually worse off when they receive outside help. The reason, Hymans argues, is that peaceful nuclear assistance encourages ‘brain drain’ to the developed world. He develops his arguments about nuclear assistance in two main chapters. First, he uses the Yugoslavia case to show how the combination of poor management and international nuclear assistance can frustrate efforts to build the bomb. Then he analyzes the Argentina case to illustrate how the recruitment of “footloose” (203) nuclear scientists from abroad can stunt the progress of nuclear programs. Hymans’s theory of peaceful nuclear assistance is interesting, but it is less persuasive than his core management theory. (Full disclosure: I argued in a 2012 book that peaceful nuclear assistance encourages nuclear proliferation, particularly when states face security threats.) This is largely because he deals with concerns about generalizability less effectively. Hymans draws on an impressive array of primary sources – including interviews – to substantiate his argument in the Yugoslavia case. Yet even if he is right about this case, it is not clear that his theory has broad support. Hymans acknowledges the potential generalizability problem, but then he goes on to argue that “a strong prima facie argument can be made that the Yugoslav experience may well have been repeated in many other cases” (199). However, the historical record does not seem to support this assertion. Ten regimes with neo-patrimonial tendencies pursued nuclear weapons according to the dataset used by Hymans: Brazil, China, India, Iran, Iraq, Libya, North Korea, Pakistan, Syria, and Yugoslavia. To effectively support his argument, Hymans would need to demonstrate that one of two things were true in the majority of these cases: (1) that high levels of peaceful nuclear assistance delayed nuclear programs by encouraging scientists to flee their home countries; or (2) that, all else being equal, nuclear projects operated more efficiently when states received lower levels of peaceful nuclear assistance. Hymans does not supply the requisite evidence. This does not mean that his argument is wrong, but one struggles to think of cases other than the Yugoslavia one where the dynamics discussed above are present. India – which scores roughly the same as Yugoslavia on the index used as a proxy for Weberian legal-rational regimes – clearly benefited from peaceful nuclear assistance and so did other states with neo-patrimonial tendencies. Moreover, it seems likely that Iraq, Iran, Libya, North Korea, and Syria would have had a greater chance of success (or succeeded faster) if they had developed more human capital through peaceful nuclear assistance. Hymans’ argument about peaceful nuclear assistance leads to a controversial policy prescription. He contends that policymakers should give “Atoms for Peace” a chance: “Yes, Atoms for Peace spreads nuclear know-how around the world – but more often than not, that serves the cause of nonproliferation” (270). Thus, according to the logic of Hymans’s theory, the United States and other nuclear suppliers should provide peaceful nuclear assistance to neo-patrimonial regimes that are attempting to develop the bomb (although he also argues that nonproliferation policies should be “finely tailored to the specific internal circumstances of states” (273)). We would be better off from the perspective of nonproliferation, for instance, if nuclear suppliers had lined up to assist Bashar al Assad’s nuclear program. I am not persuaded, based on the evidence that Hymans presents, that this would discourage – and not encourage – nuclear proliferation in the majority of cases such as this one. Still, Hymans offers an important challenge to those of us who believe that international nuclear assistance facilitates nuclear proliferation. He makes a contribution by offering a novel theory to explain the conditions under which peaceful nuclear assistance facilitates (or discourages) nuclear proliferation. His argument warrants careful attention, and it is likely to catalyze further research on this important topic. In sum, Achieving Nuclear Ambitions is an innovative and important book that should be widely read. This book – like any book – has some limitations. Yet none of the criticisms discussed in this review diminish the significance of Hymans’s work. His book has much to teach us about nuclear proliferation, management, and the implementation of military programs. Good books generally provoke new thinking about important subjects, and this one is no exception. One interesting question that emerges from this book is why leaders micromanage nuclear programs. If Hymans is correct, this strategy is bound to stymie progress towards the bomb. That leaders meddle and fail to respect scientists’ autonomy, then, is puzzling. Future research might examine the factors that cause leaders to adopt certain management approaches. Ever since nuclear proliferation became a high national security concern for the United States in the late 1960s, managing the spread of nuclear weapons has become a cottage industry. Policy makers, think tank analysts, pundits, and scholars routinely make dire predictions about unbridled proliferation. The ‘sky is falling’ approach to nuclear proliferation has become a staple for think tanks in their fund raising campaigns. And foundations have poured millions into understanding its causes and consequences. In doing so, very few have examined the empirics of proliferation on the ground. If they did, they would notice that proliferation outcomes since the late 1960s are not very successful. For example, Iran is struggling to master uranium enrichment even after throwing itself at that task for nearly 25 years. Iraq’s program sputtered to a halt after the 1991 Gulf War. And North Korea, despite all the bluster and noise, has been hugely unsuccessful in building nuclear warheads that explode with reliability or long-range ballistic missiles that fly to their designated targets. Hymans’s work challenges the conventional wisdom of the proliferation crowd that dominates U.S. academia, think tanks, and the government, and points to the obvious facts of proliferation failures in the international system. In doing so it demolishes deterministic theories of proliferation, which simplistically assume that once states devote ample resources and political will to a proliferation problem, positive outcomes will follow. Hymans turns our attention to the process of proliferation; that laborious and complex scientific-engineering undertaking, which requires not just inputs of capital, technology and political will, but also sophisticated management skills. It is the latter, according to Hymans, that breaks or makes proliferation programs. Drawing inspiration from Samuel Huntington’s Soldier and the State from half a century ago, Hymans similarly argues that institutions are critical to actualizing brute materiality. Hymans elaborates this claim by developing a two-part theory of state institutions, which operates at both the macro and micro-levels. At the macro level, the argument is that there are two typologies of political systems: “Neo-Patrimonial” and “Weberian-Legal Rational” (26). It is the latter, according to Hymans that are more likely to achieve proliferation goals. The logic is very simple. Such systems incorporate institutional checks and balances and are likely to prevent leaders from exercising power capriciously. But there is a micro-institutional aspect to success as well. Engineers and scientists require thickly institutionalized systems of scientific research to produce success. The logic here is that knowledge workers are motivated by a professional ethos. Absent that ethos, they will fall prey to demoralization and will have few incentives to deliver what political leaders ask of them to. In arguing thus, Hymans reverses our understanding of ‘principal-agent’ relationships as propagated by standard economic theory and business organization models. There the understanding is that principals control agents effectively through a program of material rewards and threats. In Hymans’s schema however, principal-agent models are better understood through the lens of psychological motivations and notions of professional rewards and successes. Overall, Hymans has produced a marvelous book that will shake up the way we understand proliferation. It is written with great spirit and aplomb, along with a levity that makes both theory and fact easy to digest. Furthermore, the outcomes across his four cases studies– Iraq, China, Yugoslavia and Argentina – have a simple explanation. Above all, his theory is both falsifiable and generalizable across the international system. All four cases that Hymans investigates reinterpret existing evidence very creatively and transform our understandings of them radically. How many of us knew, for example, that Saddam Hussein never came even close to building a bomb prior to 1991? Or that China’s hugely successful nuclear weapons program hung on the precipice of failure during the Cultural Revolution? Or that Josip Broz Tito’s quest for a bomb was an exercise in fantasy. Or that Juan Peron’s Argentina was subject to one of the greatest scientific frauds in modern history? The trouble with the book, however, lies with its treatment of the evidence and the way it applies that evidence to theory. The evidence does not really demonstrate that proliferation failures in Iraq, Yugoslavia or Argentina were caused by the capricious exercise of power by political leaders. The message from the evidence is that neo-patrimonialism is a necessary but insufficient condition for program failure. What the evidence makes clear is that institutionalized legal-rational bureaucratic and science management systems and scientific-industrial capacity are the two key variables that drive programs to success. In other words, neo-patrimonial states that have not invested in legal-rational systems of management are most likely to fail. But those neo-patrimonial states that can draw on pre-existing legal-rational structures, or have partially created them, are more likely succeed. Consider Iraq’s case, which is perhaps the strongest empirical chapter deployed to support the book’s theoretical argument. All the evidence Hymans deploys shows that Saddam Hussein adopted a hands-off approach toward his scientists between 1981 and 87. And yet the scientists had little to show for it. The problem in Iraq apparently lay with the Iraqi nuclear scientist Jafar Dhia Jafar’s authoritarian style of management. It was his insistence on the Penning ionization gauge at the center of the Iraqi electromagnetic isotope separation process over the proven calutron method of uranium enrichment that caused failure. It was his management style of compartmentalizing information and restricting horizontal professional interaction that injected inefficiencies into organizational management. The capricious style of management that Hymans associates with neo-patrimonial states began when Hussein Kamel, Saddam Hussein’s son-in-law, gained control of the nuclear estate in 1987. But that was late in the game. Even prior to his takeover, the scientists were nowhere close to achieving the success that they had promised Saddam. In advancing his argument, Hymans ignores the very obvious problems of Iraq’s technical manpower deficiencies and weak industrial infrastructure that were critical for the bomb’s success. Further, he fails to answer the even bigger questions: why did Iraq find success in its ballistic missile programs and its chemical and biological weapon programs but not the nuclear bomb program? If the neo-paternalistic state was unable to produce a fertile environment for the nuclear weapons program to succeed, then how did the other Weapons of Mass Destruction (WMD) programs and complex delivery systems such as ballistic missiles come to fruition? Hymans’s treatment of the Chinese case brings much nuance and perspective to proliferation-related alarmism in Washington. However, the fundamental message that one draws from this case is that neo-patrimonial states can and do succeed in accomplishing complex scientific and technical projects. The key difference between Iraq and China was China’s greater scientific professionalism at the micro-institutional level. The evidence shows that there was greater political interference in the bomb project in Maoist China than in Saddam’s Iraq. And yet China’s bomb project succeeded where Saddam’s failed. Of course, Hymans would argue that micro-successes and failures in China’s bomb program closely followed the trajectory of Mao’s political interference. A case in point is the success of the bomb project and the failure of the submarine-launched ballistic missile (SLBM) program, which bore the full brunt of Maoist neo-patrimonialism. Yet it is odd that China’s SLBM program took nearly two decades to fructify even in the post-Maoist era. This was an era characterized by strong institutions, globalization, and easier access to scientific personnel, technology and resources. There is obviously something missing in the ‘neo-patrimonial state as the cause of proliferation failure’ argument. Oddly enough, in his treatment of Yugoslavia and Argentina, Hymans digresses from his main theoretical argument even as he engages in an exercise of new theory building to explain proliferation failures. Creative and bold as this attempt may be, it does little to add to the broader argument he makes in the book. Hymans traces the failure of Yugoslavia’s nuclear weapons program to the ‘Atoms of Peace’ program, which created an institutional pipeline for Yugoslavia’s scientific talent to emigrate abroad. Thus when Tito ordered his top scientists to build the bomb after India’s test in 1974, the state simply did not possess the talent at hand to execute the project. But this is less an argument about neo-patrimonialism than ‘brain drain.’ Furthermore, although Hymans makes the claim that the Yugoslav scientists’ exodus to Western Europe during the Cold War was driven by a scientific-professional ethos, it is hard to establish whether emigration was the consequence of the prospect of better material opportunities in the West or professional values. The Argentinean case is also a poor example of the neo-patrimonial state theory. If anything, it demonstrates the significance of institutionalized scientific-industrial structures at the micro-level over anything else. What Hymans’s data does demonstrate, however, is the central challenge of the principal-agent problem and information asymmetries in weakly institutionalized systems. The latter is problematic precisely because the principals lack the expertise and eventually the judgment to appraise their agents. This goes for leaders at the macro level as well as for scientists and engineers at the micro-institutional level. The major challenge for political leaders is not simply to motivate their agents, but to appraise them. Likewise, institutionalized scientific systems work best, not only because they prevent the capricious exercise of power, but also because institutionalized vetting is essential for quality control; for separating the grain from the chaff. At the end of the day, political leaders are generalists. They lack domain expertise to appraise information asymmetries. They can either inspire, bribe, or use institutional mechanisms to ensure that there are sufficient checks and balances in the system to ensure that they are presented with the right choices. A nuclear program, especially a clandestine one, will necessarily be conducted amidst great secrecy. It will be placed outside the oversight of the institutions that are usually deployed to narrow information asymmetries in the state. This compounds the problem of information asymmetries and the need for institutional vetting. This is not to say that Hymans’s book does not make an original and significant contribution to our understanding of proliferation. It convinces. But the empirical evidence in the cases never matches the aesthetics of the book’s theoretical elegance. First and foremost, I would like to extend a big thank you to the reviewers for their thoughtful contributions to this roundtable, and to the editors for setting it up. I am honored and flattered by the attention. It may be helpful to begin by briefly summarizing the seven main goals of this book. To contradict the conventional view that nuclear proliferation has been spiraling out of control in recent decades. In fact, since the 1970s, dedicated nuclear weapons projects have become increasingly inefficient and much more prone to failure (3). To focus attention on the importance of bad management as a key cause of these outcomes. Historians of “big science” have found the quality of management to be hugely consequential in a wide range of settings, including the early nuclear weapons projects. I extend these insights to the issue of contemporary proliferation. To precisely identify what is ‘good’ or ‘bad’ management in the context of nuclear research and development. In the spirit of Samuel Huntington’s The Soldier and the State, I find that nuclear weapons projects run well to the extent that they respect the scientific and technical workers’ professional autonomy. More precisely, that means doing three things: providing the workers with ample resources; allowing them to control their own work process; and gaining their emotional commitment to the project, most likely through appeals to national pride (25, 50-56). To highlight deeper, structural factors that influence a state’s approach to nuclear project management. I argue that the quality of state institutionalization is the major structural driver here (26-27, 57-71). The institutional character of neo-patrimonial states tends to permit or even encourage their political leaders to exercise arbitrary and politicized management, whereas the institutional character of Weberian legal-rational states tends to constrain their political leaders from indulging in such self-defeating behaviors. To provide a nuanced reconsideration of the impact of international nuclear assistance on proliferation outcomes. International assistance—whether illicit, such as A. Q. Khan’s proliferation network, or licit, such as Western states’ Atoms for Peace initiatives—has been a major focus of the policy and academic discussion of proliferation in recent years. This recent wave of research has advanced our knowledge of the issue, but it has puzzlingly ignored the general literature on international technology transfer, which finds that the effects of international assistance depend heavily on the quality of management and institutions in the recipient country. I extend this finding of the general international technology transfer literature to the study of proliferation. More precisely, I hypothesize that well-managed nuclear weapons projects will benefit greatly from international assistance, but that poorly managed projects will benefit far less and may even be seriously harmed by their international connections (159, 204). To test these theoretical arguments against the empirical record. I rely primarily on in-depth, qualitative, historical analyses of carefully selected country cases—Saddam’s Iraq, Mao’s China, Tito’s Yugoslavia, and Perón’s Argentina. This methodology is particularly appropriate for evaluating the impact of the “soft” variables of management and institutional quality. Because small-n research designs are vulnerable to question of generalizability, however, I also present brief analyses of numerous other country cases and some crude quantitative data. To provide a set of general recommendations for nonproliferation policy (265-273). I militate for a less heroic vision of U.S. and international nonproliferation efforts, and especially for great caution in the face of proposals for military counterproliferation adventures. In addition, I defend responsible policies of international civil nuclear cooperation against the bad rap that they have gotten in recent years. Finally and perhaps most important of all, I underscore the need to avoid simplistic, one-size-fits-all global nonproliferation policy formulas. Careful assessment of each country’s politics and culture is a crucial prerequisite for successful nonproliferation policy. I now turn to the reviewers’ comments and critiques. My response is organized thematically, touching one by one on the book’s seven main goals. First of all, it should be noted that the reviewers unanimously accepted the heart of the book’s argument: first, that the world has witnessed a great proliferation slowdown; second, that bad project management by proliferant states has been a key cause of that slowdown; and third, that bad management in this case means the failure to respect scientific and technical professionalism. The strong endorsement from this diverse set of reviewers is not only very gratifying to me personally, but also and more importantly, it suggests that the field will push further in this direction. Matthew Fuhrmann expresses the wish that I had done more to measure the relative impact of bad management versus potential alternative hypotheses. I agree with him that this is where the field needs to go. However, as he also recognizes, the scholarly literature on this question is very thin, and extensive shadow-boxing with arguments that have not yet been elaborated would have been pointless. (The main exception to the general rule of scholarly neglect is the robust literature on the role of foreign technical assistance—and my book devotes two entire chapters to exploring that variable.) As for Fuhrmann’s specific concern that I might have slighted the causal importance of the top political leadership’s degree of commitment to getting the bomb, I should first reiterate the point that the focus of this book is on the difficulties that have been experienced by dedicated nuclear weapons projects, i.e., those states that are judged in the literature to have actually “pursued” the bomb, and not the larger group of states that merely “explored” the possibility (10). Leadership commitment is a big reason why some states “pursue” whereas others merely “explore,” and in fact explaining that connection was the main focus of my first book, The Psychology of Nuclear Proliferation. In the new book, however, I intentionally control for leadership commitment and focus narrowly on the efficiency of dedicated nuclear weapons projects. Admittedly, there is still variation in leadership commitment even among dedicated nuclear weapons projects. But the case studies strongly indicate that the leadership commitment variable is not the master key to the puzzle of their different levels of efficiency. For instance, in the China case study I detail how Mao Zedong’s great interest in getting the bomb was simultaneously a blessing and a curse for the program (see, e.g., 134-137). The point, then, is not that the level of leadership commitment is irrelevant, but rather that it tends to have very mixed effects—that is, unless the state’s institutions are strong enough to channel the leader’s passion for the bomb into the productive avenues of “inspiration and facilitation,” and away from the counterproductive tendency to exert “intrusive command and control” (41-42). My fourth contention, that “state leaders’ approaches to management are to a large extent driven by the macro-institutional environments in which they operate,” (57) meets with somewhat more resistance from Fuhrmann and Gaurav Kampani. I think that this is mostly due to an oversimplified reading of my theoretical argument, for which I am probably partially to blame. So, to make my position clear: institutions are not destiny. The institutional context typically creates strong management tendencies, but exceptional people or circumstances can sometimes neutralize or greatly accentuate those tendencies. For instance, in the case of China I give much credit to General Nie Rongzhen, a brilliant manager and canny political survivor who found ways to protect his nuclear scientists and engineers from the top-down interference that was endemic in the Maoist party-state (see, e.g., 140-143). And in the Iraq case study, I point out that although Saddam Hussein always had his fingers around his nuclear scientists’ necks, it was only after Saddam’s bully boy son-in-law Hussein Kamel muscled into the picture that the level of political control became utterly asphyxiating (105-114). In short, the macro level matters a lot, but the micro level matters, too. Therefore, Kampani’s apparently negative verdict that my book only demonstrates neo-patrimonialism to be a “necessary but insufficient condition for program failure” is actually not a criticism at all; rather, it is a nice summation of what I was trying to prove. Fuhrmann and Kampani’s critiques of my macro level argument also rely on an oversimplified characterization of the state institutionalization variable as a simple binary. In Chapter 2 I stress that state institutionalization is a spectrum that ranges between the two polar ideal-types of neo-patrimonialism and Weberian legal-rationalism (58). Therefore, in line with classic Weberian social science methodology, while focusing my theoretical exposition mostly on the two ideal-types, I underscore that empirical analyses need to pinpoint the specific position of states along that spectrum, as well as the direction of their dynamic institutional evolution (65-71). That dynamic element of state institutions proves to be particularly important for understanding the nuclear history of Maoist China. The reviewers are right that Maoist China can generally be described as a neo-patrimonial state, and as such poses a puzzle for my institutional argument—indeed, that is why I selected the Chinese case for in-depth analysis. It turns out that this overall coding of neo-patrimonialism, although certainly appropriate as a first cut, conceals the longstanding power contest within the regime between a neo-patrimonializing faction centered around Chairman Mao Zedong, and a legal-rationalizing faction centered around President Liu Shaoqi (146-152). When the legal-rationalizing faction had the upper hand, the nuclear program made exceptional progress; but when the neo-patrimonializing faction was in the ascendant, the nuclear program experienced heavy turbulence. In short, sometimes you need to dig beneath the surface to see the true causal power of the institutional variable. But this is not to suggest that institutions are everything. As mentioned above, I pair my institutional analysis of the Chinese case with a detailed micro-level analysis of the organizational juggernaut that was created by General Nie and the scientific and technical workers he led. This combined macro-micro story reflects the theory as elaborated in Chapter 2. The reviewers also express some skepticism about my fifth contention: that the impact of international technical assistance—licit or illicit— is heavily dependent on the quality of management and institutions. Kampani writes off this part of the book as a digression, but Fuhrmann fully recognizes that it is critically important for me to deal with the international assistance variable. Unfortunately, Fuhrmann chooses to take issue with a straw man version of my international assistance argument. He asserts that I hypothesize that neo-patrimonial regimes are “actually worse off when they receive outside help,” and then claims that even if this is what happened in the case of Yugoslavia, other historical cases provide evidence to the contrary. Yet what the book actually argues is that poorly managed nuclear weapons projects tend to benefit far less from foreign help than well-managed projects, and may even find themselves worse off as a result of their foreign linkages (159, 204). This is a very different argument than the one that Fuhrmann attempts to critique. Moreover, regarding Fuhrmann’s identification of India as a counterexample to the Yugoslav experience, in fact I offer an explicit comparison of India and Yugoslavia on pages 199-200. Unlike Yugoslavia, 1960s-70s India was a rare example of a developing country that boasted strong Weberian legal-rational institutions, so the theory is quite consistent with its good nuclear performance. Turning to my empirical testing strategy, Fuhrmann and Kampani properly sound a note of caution about generalizing from a small number of case studies. Kampani also helpfully recommends comparing across technologies as well as across countries. They are right that only by increasing the number of cases can we come to firmer conclusions, especially about the effects of international assistance. On the other hand, instead of simply expressing doubts about the generalizability of my findings on international assistance, Fuhrmann could have mentioned the important recent contribution to this debate by Alexander Montgomery in a volume that Fuhrmann himself co-edited. Montgomery’s chapter, entitled “Stop Helping Me: When Nuclear Assistance Impedes Nuclear Programs,” uses large-n statistical tests to explicitly support my argument over Fuhrmann’s. It deserves to be widely read. But again, I endorse the reviewers’ call for more work on more cases. Merely adding more cases will not be enough to achieve substantial further progress in this research agenda, however. Measurement is one issue on which the reviewers tread surprisingly lightly, but I think it is a critical bottleneck that we must address as a field. I am particularly eager to see progress in our measures of the state institutionalization variable. In the case studies, I do my best to measure it by weighing a large number of qualitative indicators, including paying very close attention to the conclusions of country specialists. I believe that this strategy produces accurate measurements, but the procedure is hard to replicate and does not allow for much comparability of measures across countries. As Fuhrmann notes, I also deploy a quantitative index of government capacity in Figure 1.2 (32) as a means of providing a rough, first-cut test of the relationship between state institutionalization and the ultimate outcomes of nuclear weapons projects. But as I state explicitly in the book, that measure is really very crude, and therefore I don’t place much stock in it (31). Montgomery has made an important advance by combining some components of the Polity IV dataset into a reasonable approximation of the neo-patrimonialism concept. But it would be preferable to develop more direct and less subjective indicators of state institutionalization. Parenthetically, in addition to advancing the proliferation research agenda, the development of such indicators would undoubtedly be useful for answering many other important political science puzzles as well. Finally we come to the lessons for policy. Michael Chase focuses his review especially on this issue. He accepts the book’s implication that U.S. policymakers can usually rely on traditional, patient nonproliferation diplomacy to control the problem, but he also emphasizes the further implication that they should be particularly concerned about any signs that advanced countries such as Japan or South Korea might be inching toward a decision to ‘go nuclear.’ In addition, he suggests that the book’s argument could be extended to the issue of the expansion and modernization of existing nuclear arsenals. Although we may be able to retain a healthy skepticism about the near-term prospects of neo-patrimonial nuclear weapon states such as Pakistan and North Korea to expand or improve their arsenals, he suggests that we need to take much more seriously the renewed ambitions of the more established nuclear powers. I heartily endorse Chase’s comments, and I might even take them one step further. As proliferation has been largely located in the developing world in recent decades, American policies and scholarly writings on the subject have become focused on the potential nuclear threats posed by developing countries. Yet paradoxically, one of the main lessons that I have drawn from researching this book is that we need to refocus our attention much more on the traditional centers of world power. The states with the greatest capacity to wreak major havoc in international politics have always been the advanced countries, not the developing ones—and I see little reason why this should not remain the case far into the future. Unfortunately, in recent years the international security debate has tended to lose sight of this basic insight of IR 101. Scholars and policymakers have exaggerated the potential threats to international peace and security that may come from developing countries and ragtag non-state terrorist groups, while understating the potential threats from developed countries—including, of course, the U.S. itself. This situation needs to change. Allow me to close this brief essay by reiterating my thanks to the reviewers and editors for their great contributions to this roundtable, and also now to the reader for making it all the way to the end. © Copyright 2013-2015 The Authors. Thomas C. Reed and Danny Stillman, The Nuclear Express: A Political History of the Bomb and its Proliferation (Minneapolis: Zenith Press, 2009), 18. The views expressed are Dr. Chase’s alone. They do not necessarily reflect those of the Naval War College, U.S. Navy, or Department of Defense. See Military and Security Developments Involving the People’s Republic of China, 2012, Washington, DC: Department of Defense, 2012; China’s National Defense in 2010, Beijing: State Council Information Office, 2011; and M. Taylor Fravel and Evan S. Medeiros, “China’s Search for Assured Retaliation: The Evolution of China’s Nuclear Strategy and Force Structure,” International Security, Vol. 35, No. 2 (2010). See, for example, David E. Sanger and Eric Schmitt, “Pakistani Nuclear Arms Pose Challenge to U.S. Policy,” New York Times, January 31, 2011. Rory Medcalf, “What to Make of India’s Nuclear Forces,” The Diplomat, February 7, 2013, http://thediplomat.com/flashpoints-blog/2013/02/07/what-to-make-of-indias-nuclear-forces/. See “New Russian Nuclear Sub ‘Safer than Kursk,’” BBC News, January 10, 2013. See Nuclear Posture Review Report, Washington, DC: Department of Defense, April 2010. See Captain Dave Bishop, “Ohio Replacement Submarine Technology,” Undersea Warfare (Summer 2011) No. 45, http://www.public.navy.mil/subfor/underseawarfaremagazine/Issues/Archives/issue_45/ohio.html. Jeffrey Lewis, “Setting Expectations for a DPRK Test,” Arms Control Wonk, January 29, 2013, http://lewis.armscontrolwonk.com/archive/6200/setting-expectations-for-a-dprk-test. Jeffrey Lewis, “DPRK Road Mobile ICBM?,” Arms Control Wonk, October 5, 2011, http://lewis.armscontrolwonk.com/archive/4555/dprk-road-mobile-icbm. For a review of the relevant literature see Scott D. Sagan, “The Causes of Nuclear Weapons Proliferation,” Annual Review of Political Science Vol. 14 (2011), pp. 225-244. See, for example, Jacques E.C. Hymans, The Psychology of Nuclear Proliferation: Identity, Emotions, and Foreign Policy (Cambridge: Cambridge University Press, 2006); Etel Solingen, Nuclear Logics: Contrasting Paths in East Asia and the Middle East (Princeton, NJ: Princeton University Press, 2007); and Christopher R. Way and Jessica Weeks “Making it Personal: Regime Type and Nuclear Proliferation,” American Journal of Political Science (forthcoming). Matthew Fuhrmann, Atomic Assistance: How ‘Atoms for Peace’ Programs Cause Nuclear Insecurity (Ithaca, NY: Cornell University Press, 2012). All of these states scored 0.5 or less on the government capacity index used by Hymans (which ranges from -1.0 to 2.0). Samuel P. Huntington, The Solider and the State: The Theory and Politics of Civil-Military Relations, (Cambridge: Harvard University Press, 1957). Thomas P. Hughes, Rescuing Prometheus: Four Monumental Projects that Changed the Modern World (New York: Vintage Books, 1998). Samuel P. Huntington, The Soldier and the State: The Theory and Politics of Civil-Military Relations (Cambridge, MA: The Belknap Press of Harvard University Press, 1957). See esp. William Langewiesche, The Atomic Bazaar: The Rise of the Nuclear Poor (New York: Farrar, Strauss, and Giroux, 2007); Matthew Kroenig, Exporting the Bomb: Technology Transfer and the Spread of Nuclear Weapons (Ithaca, NY: Cornell University Press, 2009); Matthew Fuhrmann, Atomic Assistance: How “Atoms for Peace” Programs Cause Nuclear Insecurity (Ithaca, NY: Cornell University Press, 2012). See, e.g., Najmedin Meshkati, ‘Technology Transfer to Developing Countries: A Tripartite Micro- and Macroergonomic Analysis of Human-Organization-Technology Interfaces,’ International Journal of Industrial Ergonomics 4, No. 2 (1989): 101-115; Bruce E. Seely, ‘Historical Patterns in the Scholarship of Technology Transfer,’ Comparative Technology Transfer and Society 1, No. 1 (2003): 7-48; Donald E. Klingner and Gamal M. Sabet, ‘Knowledge Management, Organizational Learning, Innovation Diffusion and Adoption, and Technology Transfer: What they Mean and Why They Matter,’ Comparative Technology Transfer and Society 3, No. 3 (2005): 199-210. Parenthetically, my consciousness of the importance of tailoring policy to specific conditions and contexts is the direct result of my methodological commitment to in-depth case study research. The experience of having to confront a mass of strange and contradictory details quickly disabuses one of any notion that there could be a simple, uniform ‘answer’ to the challenge of proliferation. Devotees of large-n analysis, beware: the methodological is political. Sonali Singh and Christopher R. Way, ‘The Correlates of Nuclear Proliferation: A Quantitative Test,’ Journal of Conflict Resolution 48, No. 6 (2004): 859-885; Philipp C. Bleek, ‘When Did (and Didn’t) States Proliferate? Coding the Spread of Nuclear Weapons throughout the Atomic Age,’ Occasional Paper, Working Draft 2.1 (2011 revision), James Martin Center for Nonproliferation Studies, Monterey Institute of International Studies, Monterey, CA. Jacques E. C. Hymans, The Psychology of Nuclear Proliferation: Identity, Emotions, and Foreign Policy (Cambridge, UK: Cambridge University Press, 2006). Christophe Jaffrelot, ‘India and Pakistan: Interpreting the Divergence of Two Political Trajectories,’ Cambridge Review of International Affairs 15, No. 2 (2002): 251-267. Alexander H. Montgomery, ‘Stop Helping Me: When Nuclear Assistance Impedes Nuclear Programs,’ in Adam Stulberg and Matt Fuhrmann, eds., The Nuclear Renaissance and International Security (Stanford, CA: Stanford University Press, 2013): 177-202. The reader should be advised that I caught an erratum in my description of the correlation between the “government capacity” index and nuclear weapons project efficiency too late to change the text prior to publication. On page 31 of Achieving Nuclear Ambitions, the correlation coefficient is reported as 0.77. The correct correlation coefficient is -0.57. The relationship between the variables remains strongly statistically significant. I apologize for the error.